The earthquake which struck the Tohoku and Kanto regions and most of eastern Japan on the afternoon of Friday, March 11, 2011 registered a 9.0 magnitude―the strongest earthquake in the country's history. 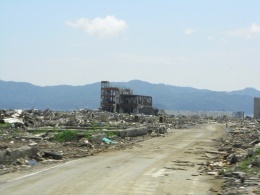 The resulting enormous tsunami wrought unprecedented death and destruction up and down the coast, particularly in the prefectures of Iwate, Miyagi, Fukushima, and Ibaraki. Current figures show roughly 30,000 people dead or missing. Many have lost family and friends, homes and savings. Many still have no choice but to stay in emergency shelters. Moreover, this cataclysmic event seriously damaged the Fukushima nuclear plant, resulting in radioactive pollution which has forced not a few people to leave the familiar surroundings of their homes. 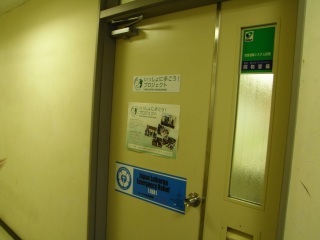 Immediately after the earthquake, the NSKK created a disaster response headquarters and began a nationwide call for contributions to an emergency relief fund. 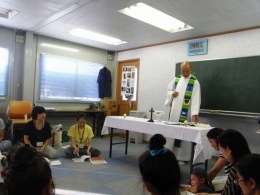 Also, in cooperation with a similar response headquarters established by the Diocese of Tohoku, we began asking churches throughout Japan for emergency relief and needed supplies. 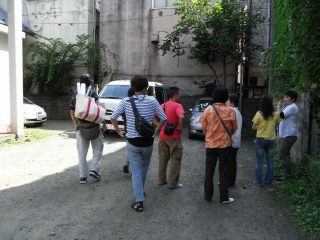 Supplies were collected at two sites, the Chubu diocesan center in Nagoya and St. Andrew's Cathedral in the Diocese of Tokyo. 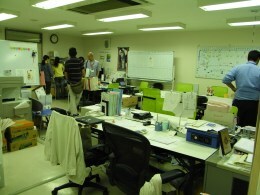 With the help of various dioceses, collected supplies were periodically transported to the Tohoku headquarters. From there, they were distributed as needed to churches and lay members, related institutions, and emergency shelters in the disaster-stricken areas. On April 1, an initial meeting of disaster response-related representatives from the various dioceses was held. It was determined that essential infrastructure and supplies were slowly being restored to disaster-stricken areas. 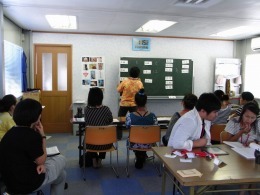 Accordingly, we stopped collecting supplies on April 15, and sent final shipments to the Diocese of Tohoku after that. 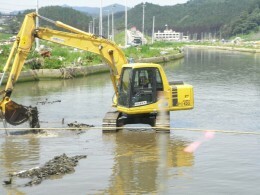 At a second meeting on April 12, representatives agreed that it was time for support efforts to move to the next stage. Given the enormity of the destruction involved, the long period of time that will be needed to restore and rebuild the region, and the international responsibilities associated with the damaged nuclear plant, it was clear that the affected dioceses could not be asked to shoulder the support burden alone. While respecting the social context and history of the devasted regions, participants in the meeting recognized the need for an organized response from the NSKK as a whole. Representatives agreed on a direction going forward: To carry out support operations drawing on nationwide cooperation under a new support structure, which would include deploying staff and volunteers chosen from throughout Japan to Sendai and other disaster-stricken areas. direction, and a steering committee for NSKK-related support and rebuilding activities was subsequently formed. The first meeting of the steering committee was held in Sendai on April 29, in which various avenues for future activities and structures were discussed, including the opening of a Sendai office. The steering committee issued the enclosed mission statement, calling for help in supporting the victims of the disaster not only from the various churches and related groups of the NSKK, but also in cooperation with other church demoninations and overseas churches as well. We humbly ask for your understanding and support, and especially your prayers for the success of this undertaking. I would also like to share the news that the Sendai office was formally opened at a Holy Eucharist held at 10:00 a.m. on Thursday, May 6, at Christ Church in Sendai. * We will walk together in respect for all who face hardships arising from the Eastern Japan Earthquake. * We will walk together toward the rebuilding of the lives and communities of the victims. * We will walk together, encouraged that our Lord Jesus Christ also walks together with us. 2.We will carry out activities with great concern for the nuclear accident and its effects, gathering and distributing information, and pursuing responsible actions both in Japan and abroad. 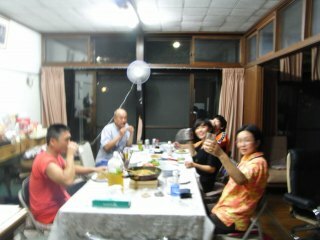 3.We will carry out activities supported by the prayers and monetary contributions of Anglican churches throughout Japan and the world. We will respond to such prayers and support through our reporting and publicizing of relief conditions and relief activities. 4.We will carry out activities from operating bases located in disaster-stricken areas, establishing a central support office in Sendai. We will hire dedicated staff and recruit volunteers. 5.We will carry out activities in conjunction with Anglican schools and other institutions, as well as with brothers and sisters from other church denominations. 6.We will carry out activities to support Anglican lay members affected by the earthquake, and toward the rebuilding of affected churches and facilities. 7.We will carry out activities in cooperation with the dioceses affected by the disaster, and with all NSKK dioceses, as a work of the whole Anglican church in Japan. 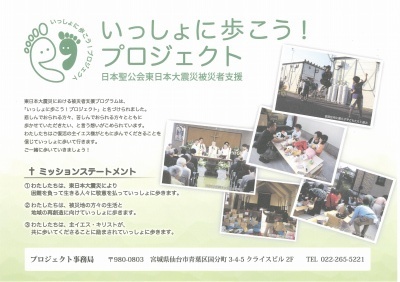 1.NSKK will form "The 'Let Us Walk Together' Project: NSKK Support for Victims of the Eastern Japan Earthquake." 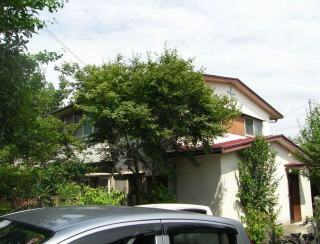 The project office will be located in Sendai. 2.A project steering committee will be formed, and will direct all project operations. 3.An office head and several staff members will be hired for this project. They, along with volunteers, will conduct support activities through the Sendai office and in other disaster-stricken areas. 4.This project will conduct public relations, liaison, and accounting functions with the cooperation of NSKK Provincial Office staff. 5.This project will manage funds raised within the NSKK for the work of supporting disaster victims, and will be responsible for the use of such funds. Walang sinuman ang nabubuhay. Para sa sarili lamang. Walang sinuman ang namamatay. Para sa sarili lamang.